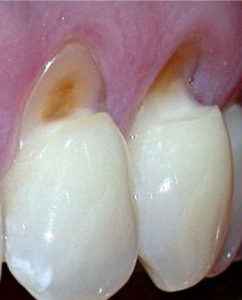 Gum recession is a common occurrence. It varies in different degrees from mild to severe. The causes can be hereditary, aggressive brushing, gum disease, poor oral hygiene, clenching and grinding, oral piercings and crooked teeth. The exposed roots may become very sensitive and susceptible to decay. Recommended treatment depends on the causes of the recession. It could involve changing your brushing technique, gum grafting, or bonded fillings to cover the exposed areas. If you are concerned about your gum recession then give our Poway dental office a call and we can examine and recommend treatment for you.